London: Barcelona became the latest football team to pull off the impossible. Trailing 4-0 after the first leg, Barcelona scored a half dozen goals on Wednesday to beat Paris Saint-Germain (PSG) 6-1 and advance to the Champions League quarterfinals 6-5 on aggregate. The last three goals, two scored by Neymar and the other set up by the Brazil striker, came in the final seven minutes of play. Here are some other memorable comebacks, with accompanying photos from The Associated Press. It was a foregone conclusion that Hungary would win the 1954 World Cup. After all, Hungary was the Olympic champion, unbeaten in four years, and had the most feared player in the world in Ferenc Puskas. And Hungary had also defeated West Germany 8-3 earlier in the tournament. Instead, the West Germans came back from two goals down in the final to beat the “Magical Magyars" with a goal from Helmut Rahn six minutes from time in a match that was dubbed The Miracle of Bern. North Korea wasn’t even supposed to reach the World Cup quarterfinals in 1966. But its shock victory over two-time world champion Italy in the group stage set up a match against Portugal. With Eusebio leading the way, Portugal was the overwhelming favourite to advance to the semi-finals. North Korea got off to 3-0 lead within the first 25 minutes, but Portugal pulled itself together to eventually win 5-3 with Eusebio scoring four. The 1982 World Cup semi-final match between West Germany and France is considered one of the greatest ever. A French team led by Michel Platini was emerging as a potential champion. West Germany, by contrast, had barely got into its stride, and when France led 3-1 halfway through the first period of extra time, the match looked over. But as other teams have learned, matches against West Germany are never over until the final whistle. Goals from Karl-Heinz Rummenigge and Klaus Fischer meant a World Cup match would be decided by a penalty shoot-out for the first time. West Germany won that, with Horst Hrubesch scoring the winning penalty. The 90 minutes had passed and with just injury time to play, Bayern Munich was set to win its first European Cup in 23 years. But despite being behind 1-0 in the Champions League final in Barcelona and having played far from its best, Manchester United had other ideas. Injury-time goals from second-half substitutes Teddy Sheringham and Ole Gunnar Solksjaer secured a 2-1 win for United and meant the European Cup was going back to Old Trafford for the first time since 1968. 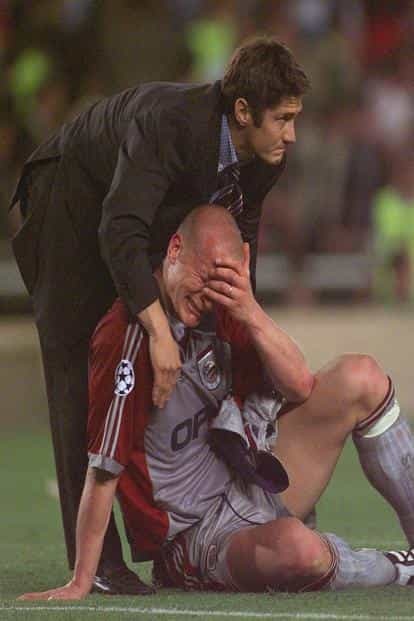 Liverpool accomplished its own memorable comeback win in 2005 when it defeated AC Milan on penalties despite being down 3-0 at half-time in the Champions League final in Istanbul. Goals from Steven Gerrard, Vladimir Smicer and Xabi Alonso in only six minutes of play early in the second half saw Liverpool draw level. Both sides had chances to win it in normal time and then in extra time. Liverpool won the shoot-out 3-2 to secure its fifth European Cup.